We designed this package to record interviews or "talking head" presentations indoors, such as an executive being interviewed for later web distribution. 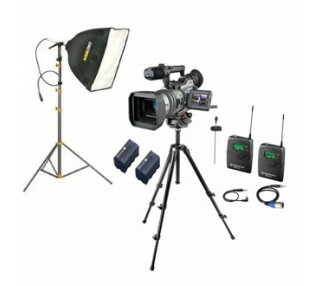 The video taping equipment in this rental includes a Sony VX2100 3-Chip video camera, Lowell diffusion lightbox, which provides flattering soft light and minimal shadows, and Sennheiser wireless lapel microphone kit. For a talking head presentation, where an executive or other presenter is talking directly into the camera, we recommend a video camera teleprompter kit, the same type of system employed by newscasters: the presenter can look directly into the camera while reading prepared text being projected on a piece of glass in front of the camera.